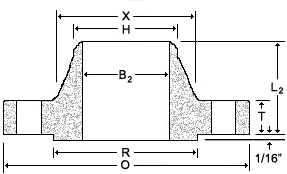 (a) - Bolt lenghts are calculated based on bolting one WN to one Blind. (b) - Bolt diameter should be 1/8" less than the bolt hole diameter. Notes: Larger sizes as well as intermediate sizes can be furnished.